This is a digital and paper archive of all printed editions of community newspapers published in the London neighbourhood of Fitzrovia since 1973. A work-in-progress the archive will contain readable microfiche-like images of every page of every edition and will include a searchable text summary. Later editions of the newspapers will be in pdf format and be searchable. We also have the original papers stored at our offices but they are only available to view by appointment. We hope to have the papers bound in the near future and be available in our community library. Tower was published from March 1973 until the end of 1979. 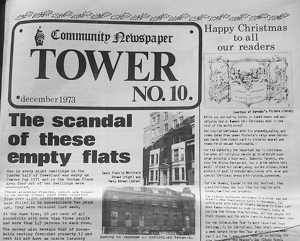 Fitzrovia Neighbourhood News was launched in November 1980, becoming Fitzrovia News some years later. The paper and its writers were committed to raising awareness of the issues affecting the residents living in this inner city area such as housing, planning and the plight of small shops and local businesses. The papers also dug into the history of the neighbourhood, profiled its people and gave the area a sense of community identity — something Fitzrovia News and its current contributors continues to this day. The archive project is being undertaken by the Fitzrovia News Community Newspaper Group with support from the Fitzrovia Neighbourhood Association. It is being done entirely by volunteers. You can visit the archive here. Fitzrovia News continues to be written by volunteers and is published by the Fitzrovia Neighbourhood Association, and has been available online since 2009.